You all asked for it, so here you go! 🙂 This one is especially for all my facebook followers – I wouldn’t be blogging and pushing myself to learn new techniques if it weren’t for your support. Thank you! 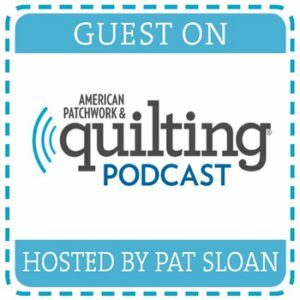 This quilt is featured on Pellon Perojects. You can find a printable version of it HERE. 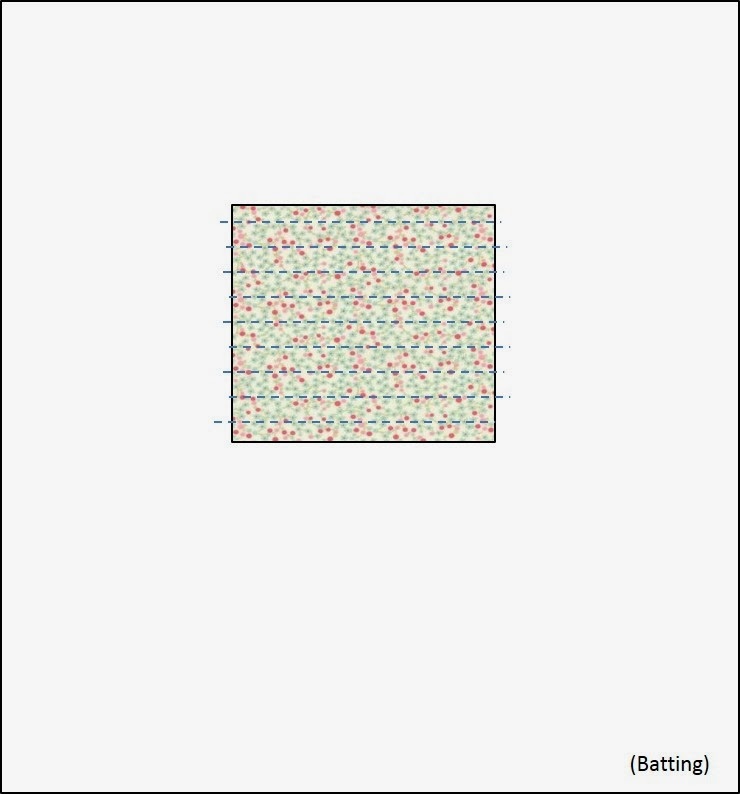 Final quilt measures approximately 33″ x 36″. It makes a lovely wall-hanging or baby quilt. 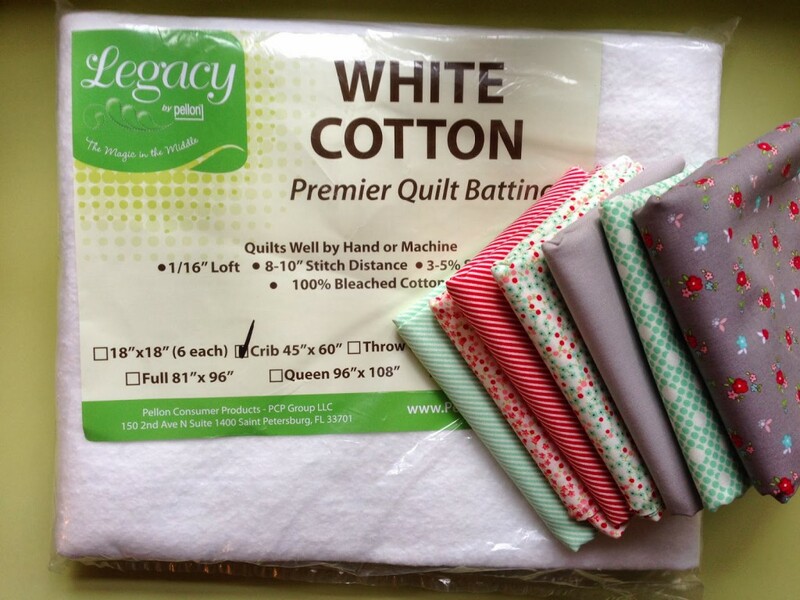 Batting: Crib-size cotton Legacy batting by Pellon. Trim down to approximately 34″ x 37″. making it very easy to work with. I got my fabric from a cute online fabric shop called Simply Sweet Fabrics. I wanted to share this because I love to support small businesses. Plus, it’s these small boutique shops that always have the best and most unique fabric selections! Please read: Before you start, I want to say that this style of Quilt as you Go does not use precise measurements, so you’ll notice me saying to cut approximate (~) size pieces. And remember, you can make your strips as narrow or as wide as you want to give it a different look. Also, when quilting your pieces directly onto the batting, make sure your stitch starts and ends on the batting, as illustrated in my photos below. Step 1: From your fabric, cut an ~8″ square. Place it in the center of the batting (I placed mine a little above the center). Quilt it directly onto the batting. Step 2: From the length of your fabric, cut a strip that’s ~6.5″ wide. Place the strip next to the square and trim using fabric scissors so it’s the same length as the square. With right sides facing together, sew a 1/4″ seam allowance. Press open with an iron, and then quilt it directly onto the batting. I quilted lines that ran parallel to the seam. Step 3: From the length of your fabric, cut a 2nd strip that is ~5.5″ wide. Using fabric scissors, trim the strip so it’s the same overall length as the previous two pieces (as shown below). With right sides facing together, sew a 1/4″ seam allowance. Press open, and then quilt it directly onto the batting. 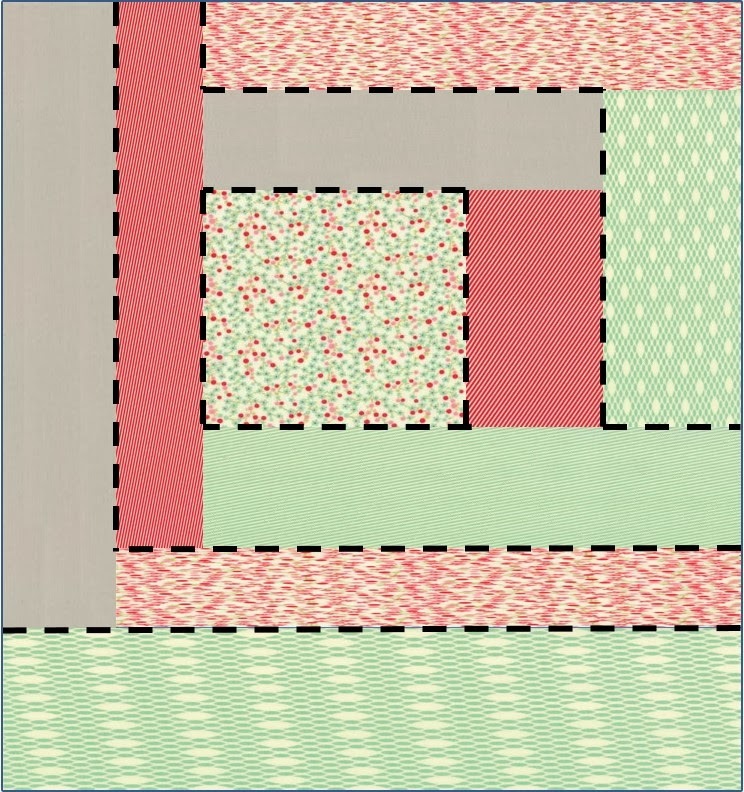 I did free-motion quilting for all the solid-colored fabrics because the design shows up better. Whatever design you quilt, make sure it runs parallel to the seam. Step 4: Continue adding strips using the method previously explained, except add them in the order shown below. For example, the next strip to add would be #4. 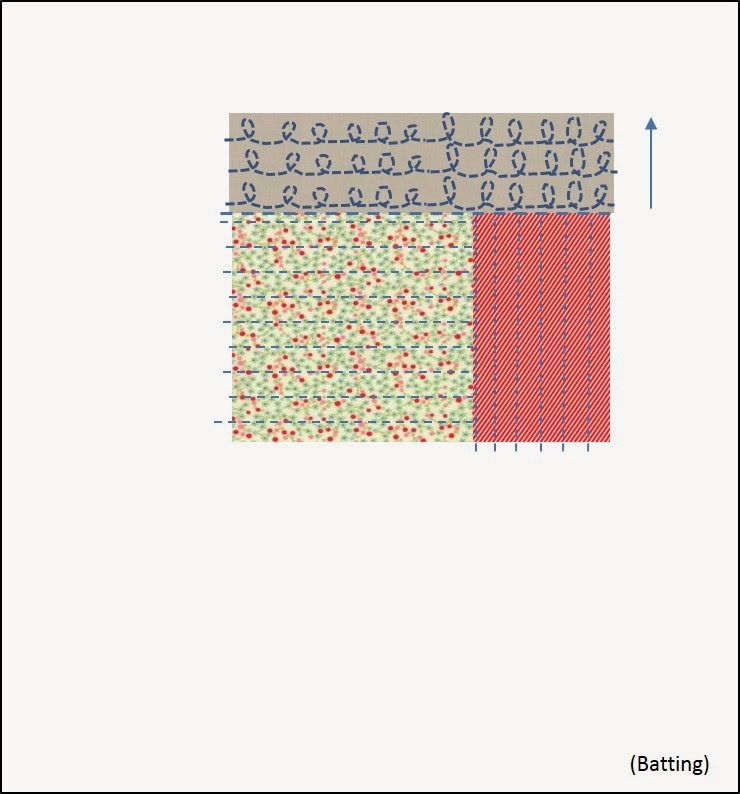 The approximate widths of the fabric strips are as follows. Be sure to cut the strips along the length of your fabric as you need to work with longer strips. Then simply trim to size using fabric scissors. Tip! Fabric can shift while stitching on the batting. Correct for this by keeping the strips aligned and ‘square’ them as necessary. 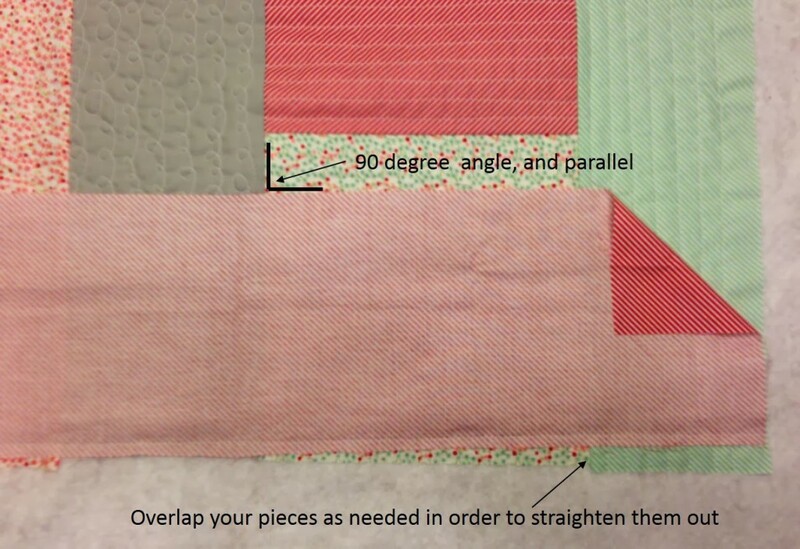 Each successive piece should be at a 90° angle to the previous quilted piece. 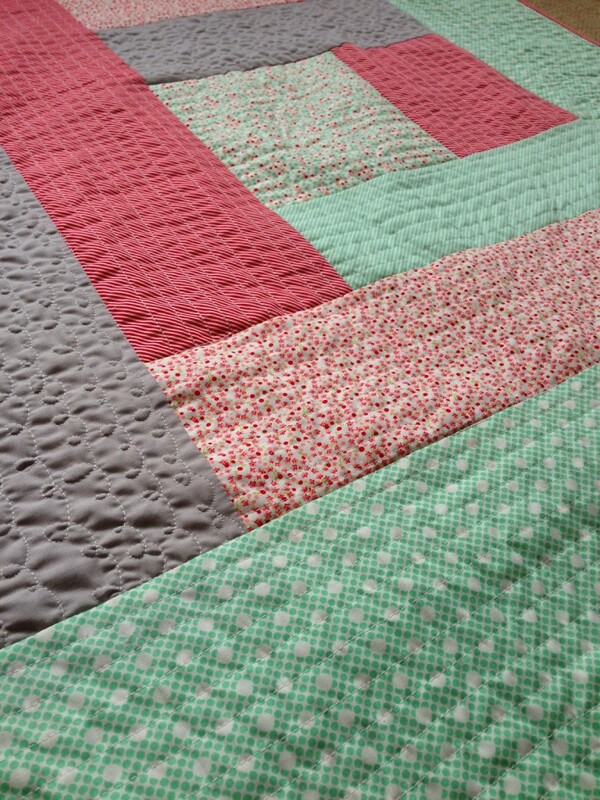 Step 5: After all of the strips have been attached, your quilt will look similar to this. 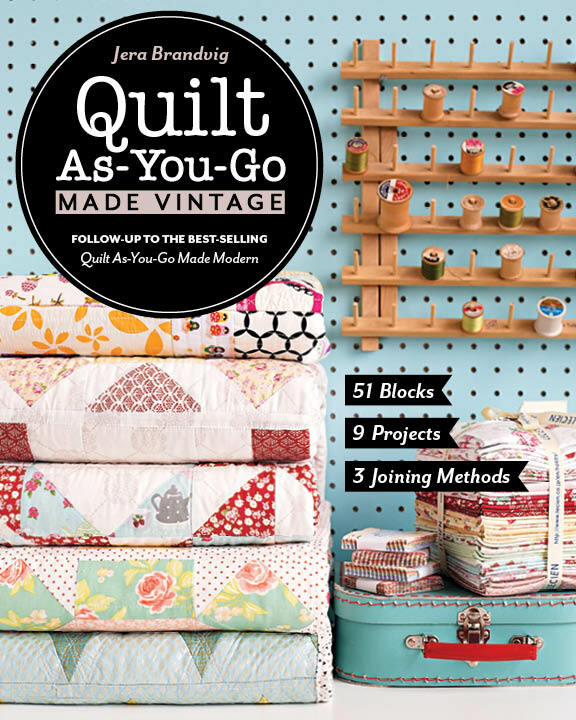 The next step is to square up your quilt. With the batting side facing you, trim off all the excess fabric outside the batting. 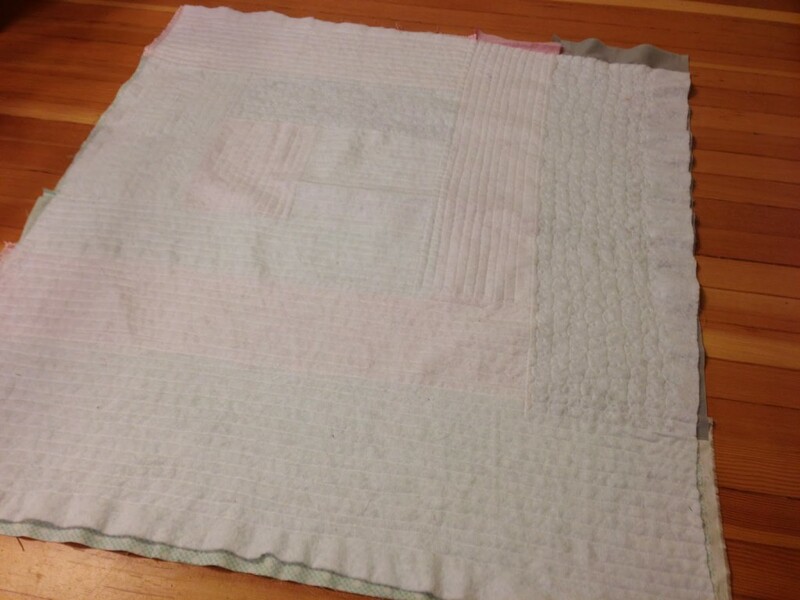 Then, fold the quilt in half and align the fold with a line on a cutting mat grid. Straighten the quilt as much as possible. Trim 1-2 inches on the sides with no fold to square it up. 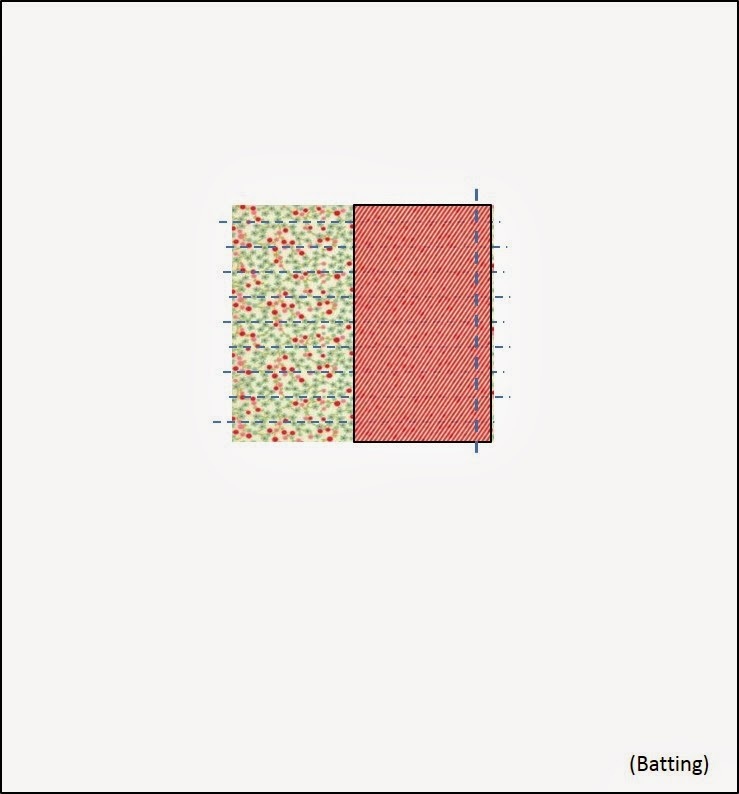 The quilt will end up measuring approximately 33″ x 36″. Step 6: The last steps remaining are to add the backing fabric and then bind the quilt. 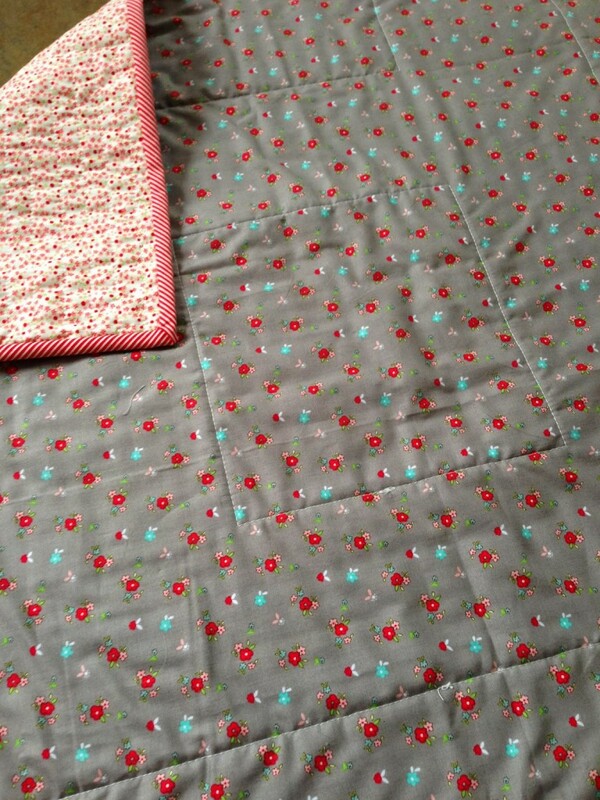 To add the backing fabric, baste the 1 yard of backing fabric to the quilt. Obviously, since you’ve already quilted the fabric onto the batting, all you need to join is your quilted top and the backing fabric. This makes basting really fast! Minimal quilting is needed to attach the backing fabric. I simply did stitch-in-the-ditch in the seams, as designated by the dashes below. Stitch-in-the-ditch is basically stitching a straight line directly into the seam. I suggest starting out really slow when doing this. Whichever seams you decide to stitch-in-the-ditch, have fun with it and keep in mind of the design it will make on the back. 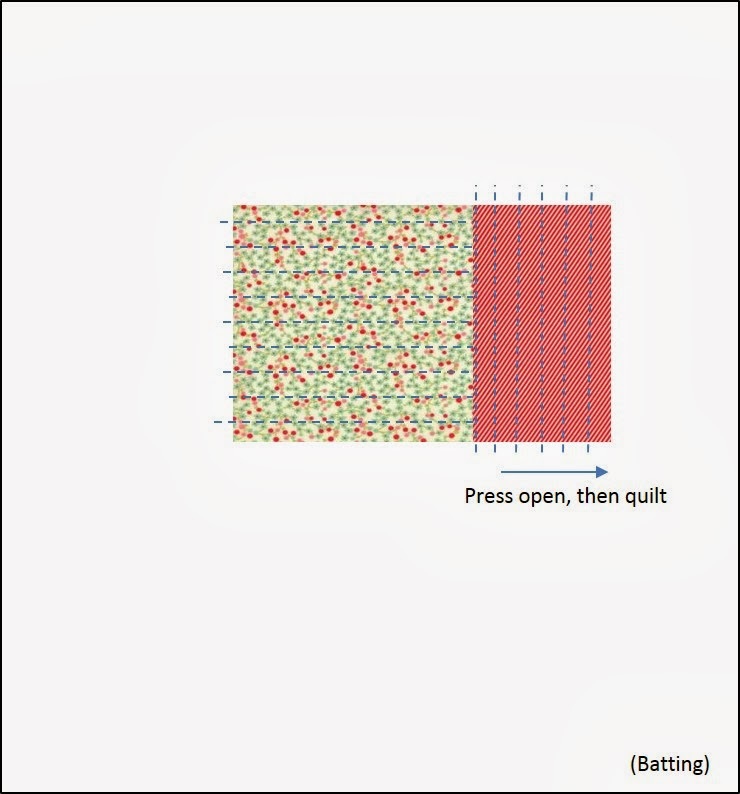 Lastly, bind your quilt! 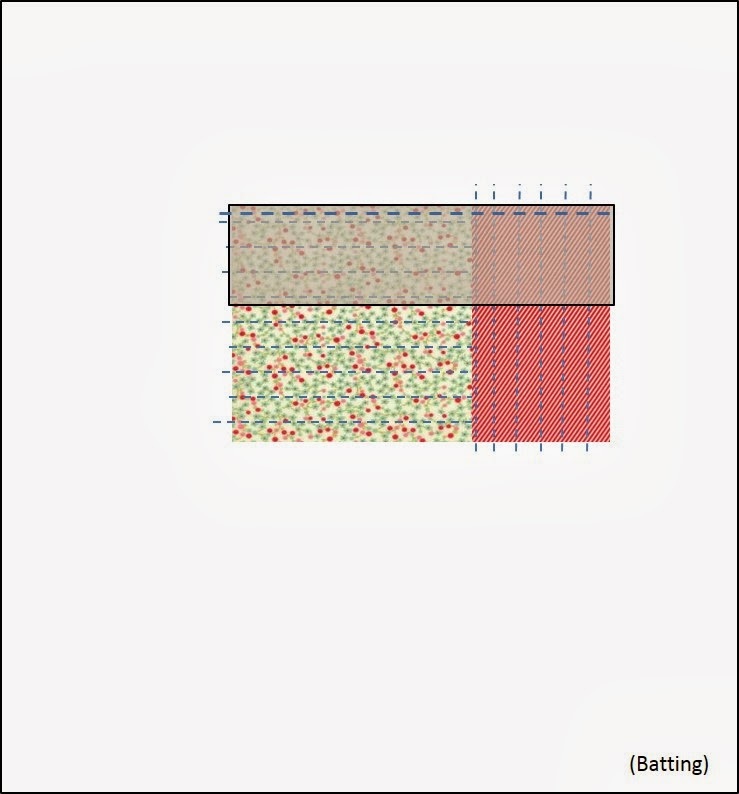 check out my easy binding tutorial. Wow, thanks for the tutorial, very cool! Yay! What a wonderful treat!! Thank you! Can't wait to try this and to buy your book. Thanks for doing this tutorial–wonderful instructions. Thank you! 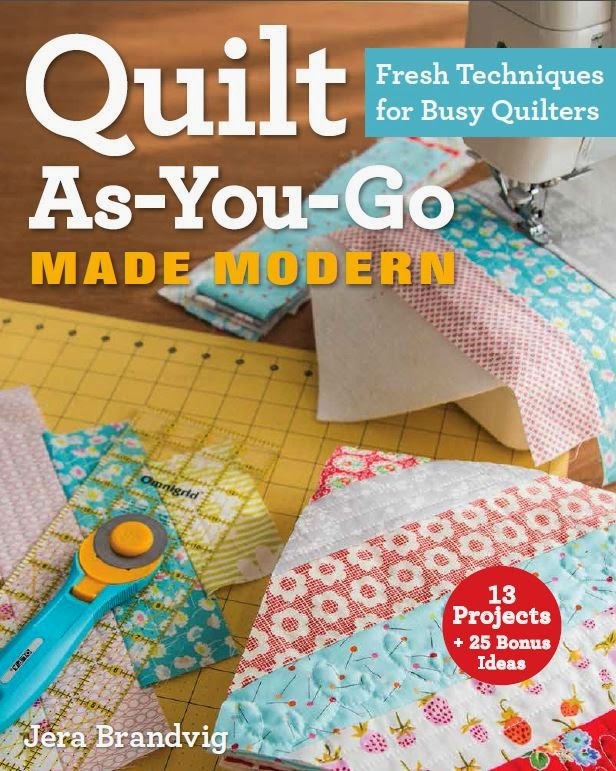 Your quilting style is very encouraging to a beginner like me. So many tutorials demand so much "perfection" but yours encourage creativity and just doing it. Very nice and appreciated! 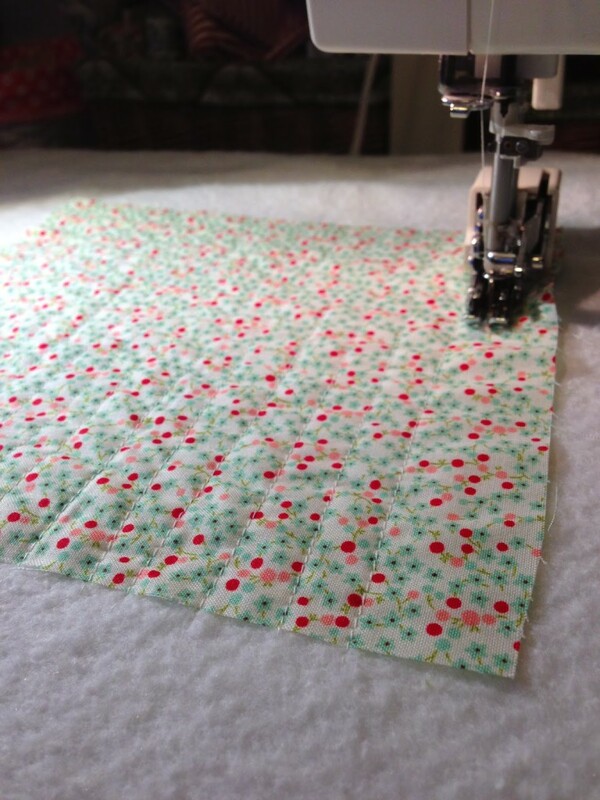 Also quilting in the rain … Gotta love SW WA in the winter! 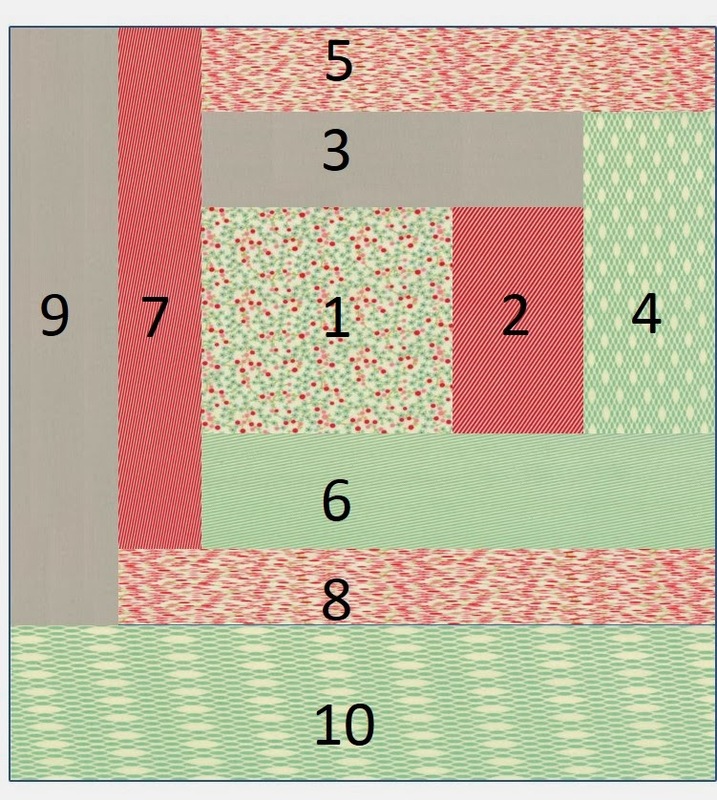 This is so simple that even a new quilter as myself can do it, Thanks you so much for sharing this. When is your new book coming out and what is the name of it? I'm now a follower. Brilliant!! Perfect for a beginner. Love it. love your blog, just pre-ordered your book. Thanks…. love the quilt and your sharing! I have 3 new grandbabies coming this spring and this will make sweet easy gifts to keep them wrapped in Gramma's love! Thanks for the great idea! 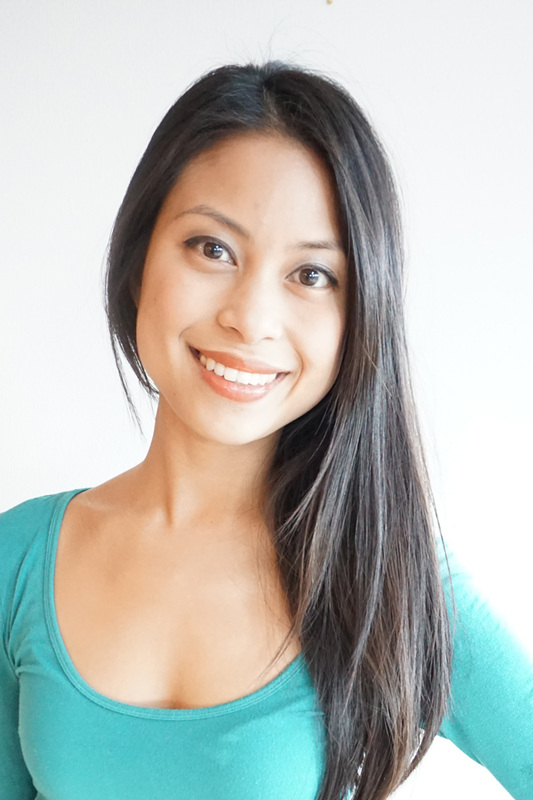 Great ideas for my little class of beginners! Thank you! 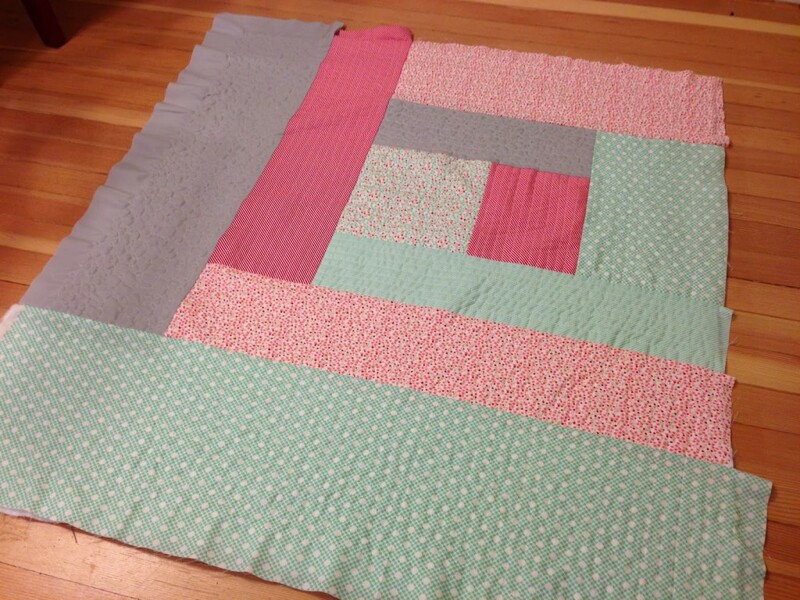 Thanks for sharing – I loved making this little quilt this week, and linked to your tutorial in my newsletter. 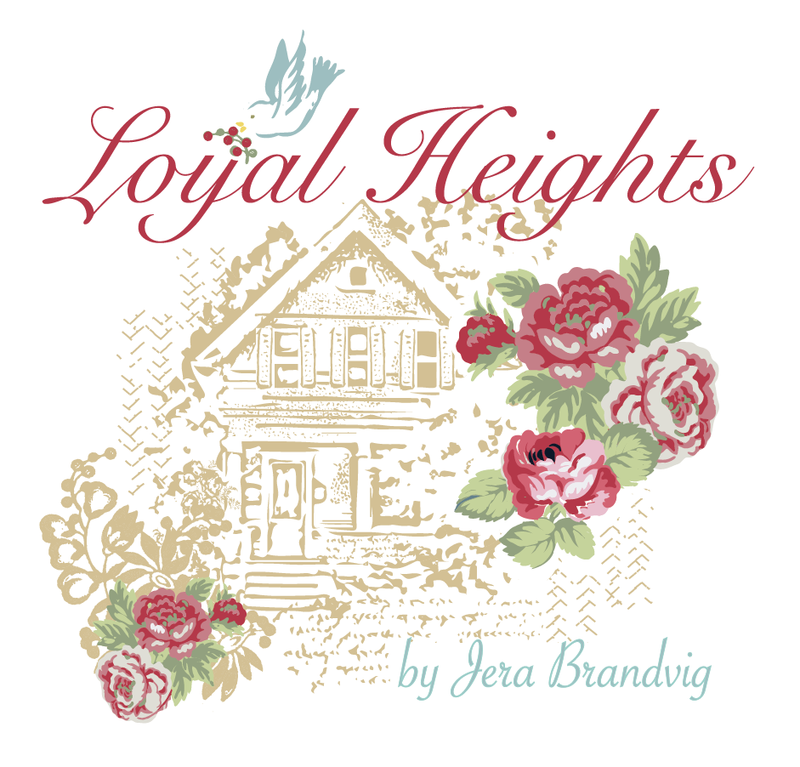 Jera, Your quilting and the fabric colors you use are always so soft, gentle and soothing. I always look forward to your next project and am never disappointed. Your fabric lines are beautiful, keep up the good work.